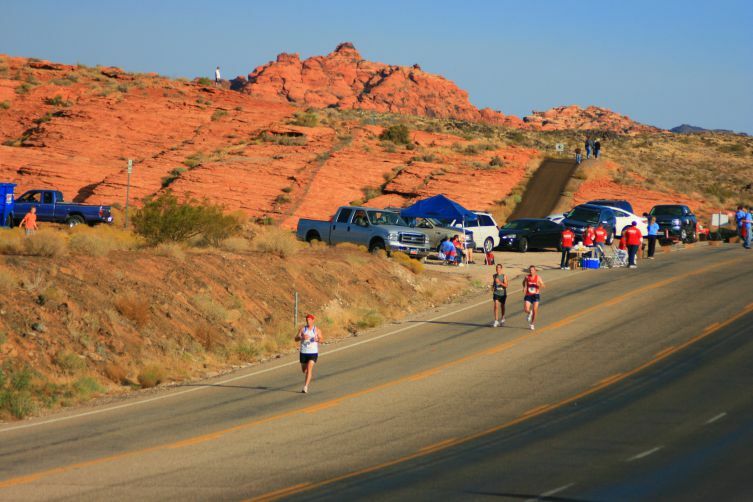 This past weekend I headed to Utah with a great group of friends to run the St. George Marathon. We’ve been counting down toward this day since May when we found out we got in through the lottery system. I was extremely excited for this race because of the fast and scenic course. I love traveling to different places to run because it’s such a great way to see a city. 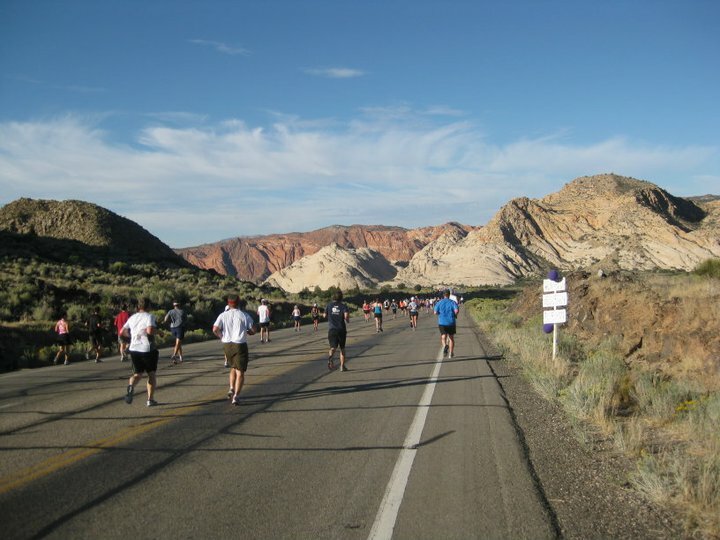 Although there isn’t much going on in St. George, the beauty of the city lies in the gorges and mountains. The alarm went off at 3:30AM on Saturday. Our hotel, The Ambassador Inn, had a great breakfast spread for us runners. Frankly, the spread at the hotel was way better than the post-race food, but I’ll get to that later. We were lucky enough to have a friend who was only pacing to drop us off at the shuttles that would take us to the start of the race. The bus pretty much drove right along the course, we noted all the uphills and downhills that we would be tackling on the actual course. 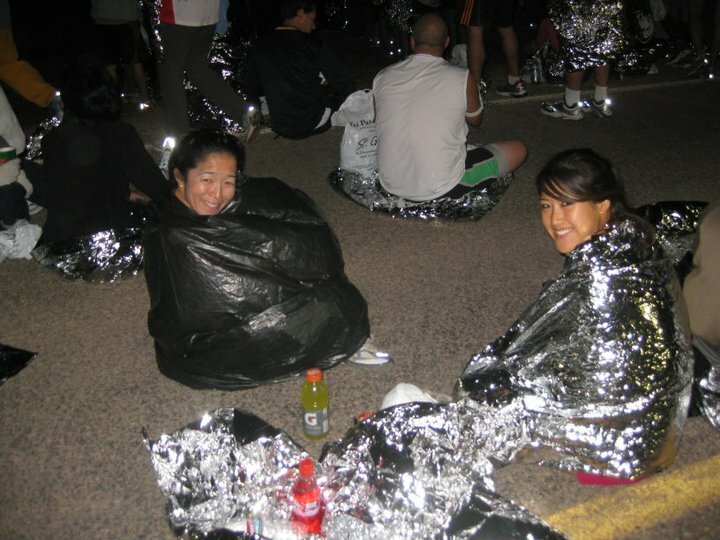 It was pretty chilly at the start, but the race people gave us foil blankets to wrap around ourselves. We huddled on the floor, waiting in anticipation before lining up at the start line. We were actually pretty close to the front of the race, next to the 3:20 pace group. It wasn’t until a minute before the race started that I realized that I couldn’t just let the 3:40 pace group ‘catch’ up to me or else I would finish in over 3:40 since I was starting out ahead of them. Too late to do anything drastic, me and my friend Meg who was also shooting for 3:40 or faster kept our first 2 miles at a slower pace. When the first mile beeped, I told her we were still going out too fast (8:40) and slowed it down to 8:45 during the second mile. It was really hard to restrain myself, but I just kept my head down and let all the runners pass by. I knew we had a long way to go and starting off slow has always saved me in previous races. We started to pick up our pace at Mile 3 after our legs warmed up. I had to go to the bathroom really badly ever since the race started and was debating whether or not I could just hold it in for the rest of the race, but decided at Mile 4 to make a quick stop. Of course, since this was still early on in the race, all the porto potties were being used. I paced around frantically deciding whether or not to wait. I saw Meg go by and then my other friend Kerry. I knew I had to make up a lot of time. I probably lost 2-3 minutes during that break, but it felt like forever. When I finished, I started sprinting to catch up to Meg. I saw Kerry and asked her what pace group that was in front of us and she told me it was the 3:40 group. Since I had to stay in front of that pace group the whole time, I started panicking and running faster to get in front of them. I never saw Meg for the rest of the race, not sure what happened, but from then on, I tackled the course by myself. Mile 7 was a pretty brutal uphill. I didn’t think it would be that bad, but it took a lot out of my legs. I knew it was a 4 mile climb so I immediately slowed down my pace. The people who were sprinting up the hill were going to eat it later on in the race. I just kept telling myself that from Mile 11 on was going to be a breeze and that I just had to make it to Mile 11. The sun was starting to come out and I could tell it was going to be a hot one. My mouth was constantly dry even after hydrating the entire week before and the water stations were 2 miles apart. I began to eagerly look forward to the next water station and would drink 2-3 cups of Gatorade/water. After Mile 11, I was feeling pretty good. My splits were right on and I was making up for the lost time going uphill. It was good until Mile 19 when I knew there was something wrong. The sun was bearing down on us and my eyes were half open because of the heat. I spent part of the course with my eyes shut for a couple seconds just to give my eyes a break. I knew we were just going straight and the runners were all fairly spread out. Probably not the smartest move, but it helped somewhat. Even though my legs weren’t tired, I was getting so light-headed and dizzy from the heat. Apparently it was around 90+ degrees during the race. Everytime I would go through a water station, I would spend 1/2 a mile after dry heaving and feeling nauseous. I knew I had to drink water because the water stations were 2 miles apart, but the water/Gatorade wasn’t sitting well in my stomach. Throughout the whole race, I only took one gel and one GU chomp. I really couldn’t stomach anything else. I was also lucky enough from Mile 11-19 to have this girl right next to me that I could draft from. We were neck in neck for most of the miles until my body started overheating. Mile 19-22 was a nightmare. Even though I wasn’t physically tired, I couldn’t run as fast as I wanted to. Even the downhills felt like work because my body was getting so hot. I had to slow down considerably and walk through the miles. At that point, I was just hoping to finish the race in one piece. I kept asking volunteers if there would be more water stations, but they said it was still only every 2 miles. I couldn’t believe they hadn’t anticipated the heat and decided to put in more water stations (ever heard of weather.com?) I started splashing cups of water on my face to cool me down which helped a lot, but the heat was still really strong. I saw a lot of people on the side of the road laying down and being taken off the course. The worse part about it was that there was no shade whatsoever. The only time there was shade was for 1/2 a mile when we were passing through the mountains and it was an overcast from the shadows. My mood lifted immediately when I saw the shade. I told myself that if I kept up this run/walk thing until the end, I would be out there in the sun for a very long time. I started to run again and luckily, bumped into my friend, Ron, who was there to pace us around Mile 22. He saw how exhausted I was and tried to motivate me to keep it up. I only had 4-5 miles left in the race, which normally wouldn’t be that big of a deal. I was so fortunate to run into him and have him pace me on the side because he brought down my pace a lot. He would grab a cup of water and hold it for me until I needed it and kept me motivated to keep going. I ended up passing a bunch of people towards the end by taking shorter and faster strides, clocking in sub 8 min/miles. The last 2 miles were in a neighborhood and I found solace under any tree shadow I could find. They handed out wet towels the last mile which felt really great, but I wish they could have done it earlier on in the race. The last mile was probably the longest mile ever. Even though I clocked it in at 8:20 pace, my entire body was fighting against me. I can usually sprint the last 1/2 mile to a mile of race, but this time, I couldn’t. I had nothing in me to go any faster and the Finish line seemed so far away. My legs were trashed, my body wanted to quit, but I knew I had to finish strong. I crossed the line and almost collapsed into the arms of the military men surrounding the finish line. I gasped for water and frantically searched for water after I got my medal. I couldn’t believe they weren’t handing out water bottles at the finish! I had to walk through the entire finish line area to look for a cup of water. I saw that they were giving out soda/ice water in cups at this truck, but the lines were huge. I couldn’t believe they would do this to us in this kind of heat. The volunteers were handing out ice cream sandwiches, but not water. Ridiculous. I was on the verge of passing out and had to wait 10 minutes just to get one cup of water! I wasn’t even hungry after the race and ended up waiting for friends for the next 2-3 hours after the race. Diet Coke and almonds probably wasn’t the best way to refuel after a marathon, but I just felt so sick and exhausted. My official time was 3:46:31, which is actually a lot better than I expected. Thanks goodness for the fast course or else it would have been a lot worse. I’m determined to come back next year and race this course again to see how fast I can run it given better weather conditions. I am fairly confidant that I had it in me to come close to or break 3:30 that day. My body and legs were feeling good, but the heat really takes a lot out of you. Oh well, you can never have the perfect race. You just have to work with what you are given. Now time to start building mileage again for Northface 50 miler in December! Mile 5: 7:39 must make up for lost time! Mile 11: 9:25 is this ever going to end? Mile 21: 9:05 water station! Mile 25: 7:58 I can’t go any faster! I had no idea y’all had to go through such heat. Love reading your marathon re-caps! I was there too. 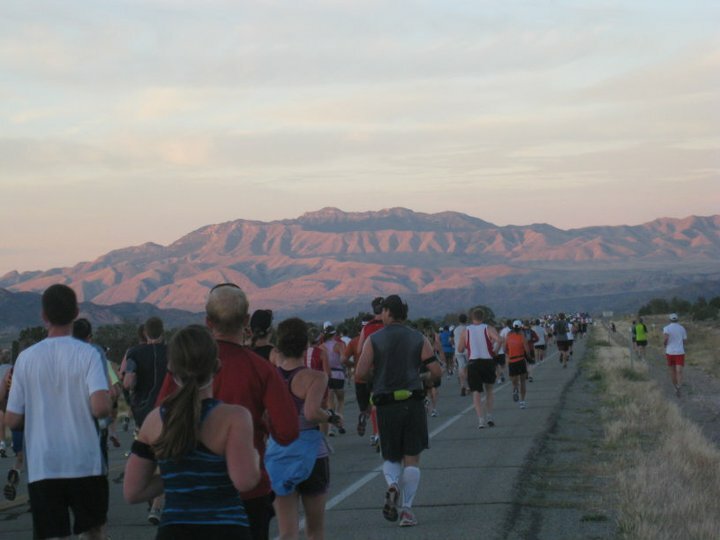 My first marathon or race ever and I was told not to train in the heat because it wouldn’t be hot. So, I did no training in the heat. I thought I was going to die from heat stroke and slowed down even though my body felt strong. I was disappointed that it took me 6 hours to finish and that I couldn’t get water at the end either. I want to try again to see if I could do better. It is comforting to hear that others struggled in the heat as well…I hope that is why my time sucked :). Holy hell, this race sounds miserable in that heat! I’m surprised you made it through alive, let alone with such a good time. It’s great that you have such a positive attitude about it all, even after you had such a mental/physical struggle during the last miles. You are truly a seasoned marathoner!